The public will get another look tomorrow at DOT’s bike plan for 110th Street on the West Side. In June, DOT proposed painted bike lanes for 110th Street between Riverside Drive and Frederick Douglass Circle, at the northwest corner of Central Park. Members of Manhattan Community Board 7 said that wasn’t good enough, asking DOT to come back with a design that protects cyclists from motorized traffic. As a connection to the greenway and Central Park, and the southernmost east-west cross street before Central Park disrupts the grid, 110th gets a sizable amount of bike traffic. Those numbers will only go up following Citi Bike’s recent Harlem expansion. On Tuesday, DOT will come back to CB 7 with its revised design. If you want 110th Street to be safe for New Yorkers of all abilities to bike on, it’s important to show up. Here are this week’s highlights from the Streetsblog calendar. Check the full calendar for more info on these and other events. Today: The Brooklyn CB7 transportation committee will discuss a speed hump request for 44th Street between Sixth and Seventh avenues, parking enforcement in the district, and B63 bus service. 4201 Fourth Avenue. 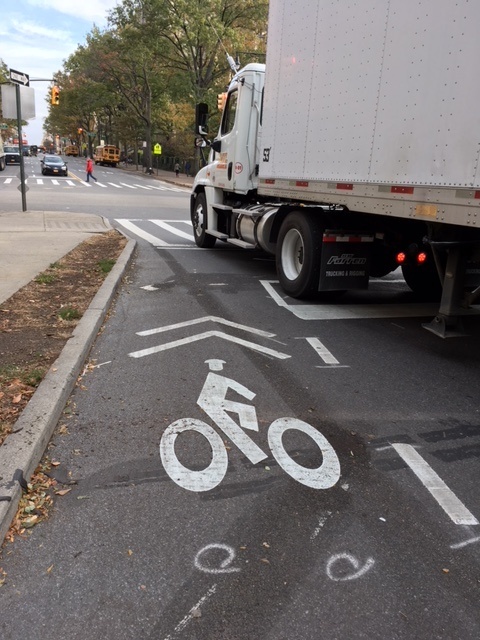 6:30 p.m.
Tuesday: The Manhattan CB 7 transportation committee will consider DOT plans for bike lanes on 110th Street, pedestrian safety at Frederick Douglass Circle, and a resolution calling on DOT to study traffic on Broadway. 300 W. 110th Street. 7 p.m.
Thursday: The Biking Public Project, dedicated to improving conditions for working cyclists, holds its monthly meeting. CUNY Grad Center, 365 Fifth Avenue, Manhattan, room 6304.01. 6:30 p.m.
Friday: Join the Transportation Alternatives Queens Committee and its #bike2QBB Crescent Street Protected Bike Lane campaign for a bike-to-work social ride. 30-04 30th Street, Astoria. 8 a.m. Details here. I live near here and sometimes drive out of town for the weekends and I very upset that even more space is being handed over to bikes, many of which don’t even obey the law and none of which pay taxes. Just kidding – I do live near here and sometimes drive out of town for the weekends, and am quite happy about this. Cars go way to fast heading east on this section of street, and it’s not good. Lots of bike traffic too. Conservatives complain that bikers “don’t pay taxes,” implying that the government should therefore not be responsive to their needs. Liberals make similar claims about “suburbanites.” Both sets of claims are dubious, at bets. I’m a suburbanite on a bike, so I get the short end of both sticks. Plus, my bike is electric-assist, giving even more people reason to hate me. It’s a wonder I ever get to my destination without encountering road rage from motorists, cyclists, pedestrians, crotchety old Upper East Siders, yippie dogs, etc. In the 1990’s we would get very excited about bike lanes like this. Then came protected bike lanes, and we all became aware that three of the five foot width of these painted lanes is in the door zone of parked cars. A big segment of this route includes a steep hill between Amsterdam and Morningside Avenues. This is probably an improvement, but for 2018, seems like underachieving. The real problem here is allowing unrestricted curbside parking on both sides of the street. That both reduces space for protected lanes and spawns double parking — especially on the South (EB) side of 110th. So, perhaps better, but new lanes still will not pass the “would I let my 14 year old ride here without an adult” test. DOT should be aiming higher. Why is it so hard to do a protected lane midblock and then add turn lanes at intersections? That’s a good point. No bike has ever paid taxes. Now that I think about it, no car has ever paid taxes. No train, neither! All these vehicles just lying around and none pays taxes. Houses, apartment buildings, and commercial skyscrapers also aren’t paying taxes! Who let it get to this sad, inanimate object tax evasion state of affairs? Isn’t the park closed at dusk? Wish DOT would provide protection on 106th too. The Park is officially closed from 1:00am to 6:00am. Also, why do the protected bike lanes on Amsterdam / Columbus (I forget which) mysteriously disappear 2 blocks before 110 St? Amsterdam. I’m told the lane is now complete to 110th but haven’t seen it for myself yet. I went that way Sunday afternoon; the lane is indeed now complete to 110th. I figured the reason it used to stop at 107th is that Amsterdam becomes 2-way at 110th, and it gave riders a chance to merge over to the right hand side of the ave if they were continuing north. That may just be post-facto rationalization; moot now anyway. For the second time this year, DOT came to Manhattan Community Board 7 with a redesign of 110th Street that doesn't include protected bike lanes. And for the second time, board members told DOT to go back to the drawing board.